Randall Munroe (author of XKCD and What If), once wrote a What If about how fast one would have to drive a car in order to have rain water shatter the windshield. The article, unfortunately, is only talking about automobile glass. And while I'm sure it's true that automobile glass would shatter if rain hit it at super sonic speeds, it's pretty clear to me that the glass on supersonic aircraft is not shattering when it flies through precipitation. So, what is done to a super sonic aircraft's windshield to keep it from shattering when flying through precipitation? ...Normally, this shockwave would move at the speed of sound within the liquid—about 1300 m/s, four times faster than in air. However, at high impact speeds, this shockwave actually moves substantially faster than the speed of sound in water. ...In addition to the direct downward pressure, the water jetting sideways can cause damage, too. If the material has any microscopic holes, cracks, or bumps, those jets can strike them and create new cracks or widen existing ones. The Concorde had 2 discrete windshields for different stages of flight. During subsonic flight (mainly take off and landing) the nose was drooped and the inner windshield was exposed. 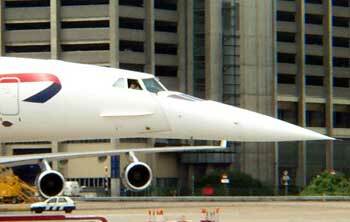 For supersonic flight the Concorde would raise its drop nose which also contained an outer windshield that would cover the inner windows. This outer windshield was made of special heat resistant glass that was also tinted. It can be assumed that this outer windshield could also withstand any pressure exerted during supersonic flight. 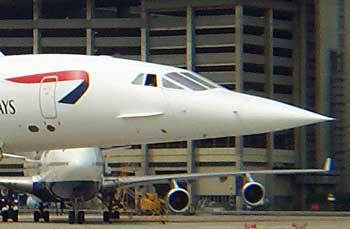 The bigger problem in the Concorde was heat: the nose had to have fuel pumped through it just to keep it cool enough. For what it's worth the Concorde flew at about 50,000ft when it was supersonic; this is well above most weather systems. 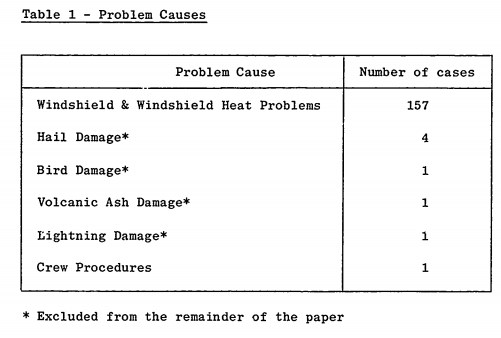 Heat fatigue and manufacturing defects (what I assume they mean by saying the windshield itself is the issue) are the primary cause of the issue according to this data. Here is one of the patents filed for what appears to be the Concorde windshield; it's an interesting read! 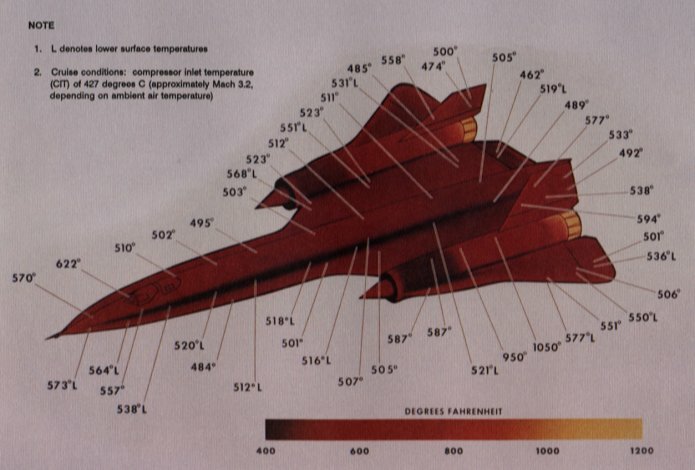 Going further, if we look at the most extreme case of supersonic planes, the SR-71 Blackbird, the inside of the windshield was in excess of 120°C and the exterior of the nose area would be closer to 260°C during supersonic flight. This would turn any water into vapor if it came into contact with the surface. While I don't know the specifics of that, the Blackbird flew at close to 80,000ft, so it too was above most (if not all) weather. I can't yet find an official quote of what that windshield was made of, but heat was still a larger issue than hitting rain. Here is an interesting paper on what happens to water droplets when they suddenly encounter a high-speed airstream. It might suggest that such an impact with an aircraft would also cause vaporization, aside from the heat of the surface causing it. 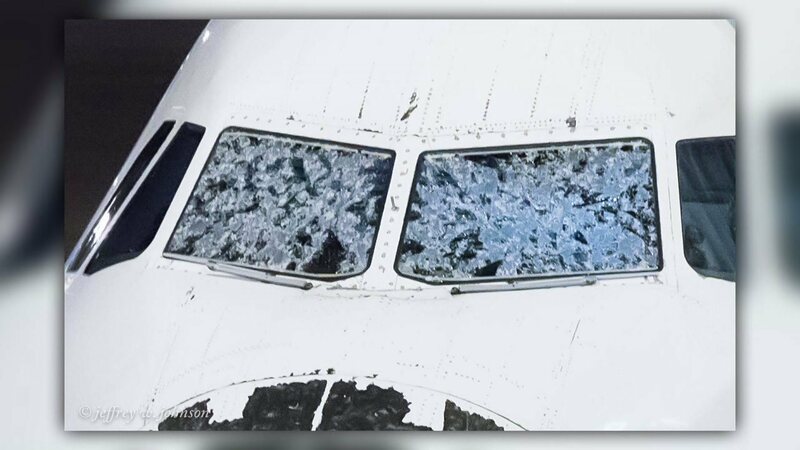 Even subsonic aircraft windshields are extremely strong; they can take continuous hits from solid hail chunks and not shatter. The first trick to make windshields stronger is used also in aerodynamics: Sweep reduces the effects of speed. Giving the windshield an inclination both back- and sideways will reduce the impact energy of whatever hits it in flight direction. 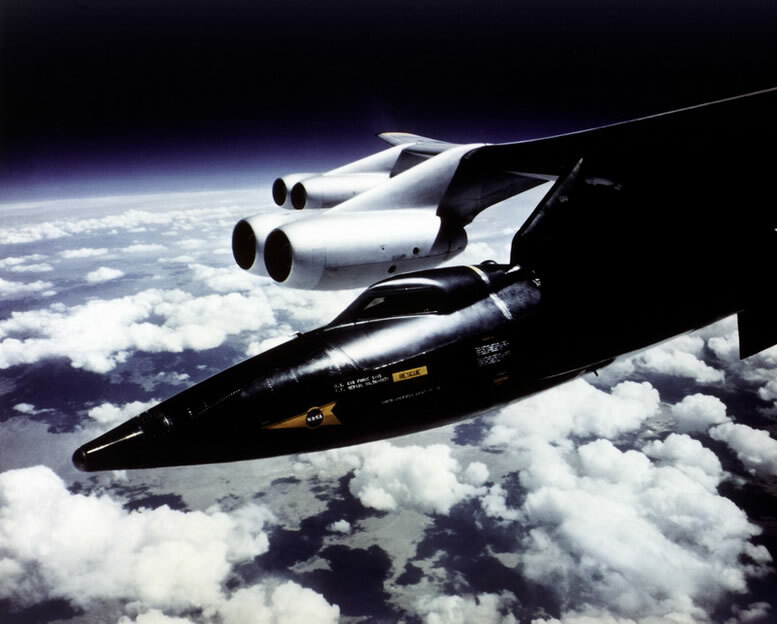 X-15 carried by a B-52 (picture source). Note the angled windows: They were oriented at 75° to the air stream, so an object hitting them at 2,000 m/s (Mach 6.65 at altitude) would "feel" like an impact at 500 m/s against a surface at right angle. Not that it would rain at 80 km up, so this was mostly for aerodynamics. And the second trick is used always if things are at the risk of breaking: Make them thicker! The thickness of a supersonic fighter canopy is approximately 20 mm and that of an airliner even 50 mm, whereas your average car glass is only 4 to 6 mm thick. Also, windshields are multi-layered: In airliners as in cars, they are made from tempered glass and polyvinyl butyrate, and the spherical canopies of fighter jets made from polycarbonate, polyurethane and acrylic. Finally, the goal of the engineers is only to make the structure withstand the impacts over a certain time, which can be only minutes for supersonic flight. Birdstrikes are one-time events, but rain impact is an ongoing process which erodes any surface over time. The single raindrop or hail impact will only cause local, microscopic damage, but enough of them over time will wear down any structure. How do aircraft windshields not crack when flying through precipitation at supersonic speeds? You are talking about a phenomenon called rain erosion at supersonic speeds. Just because a small steel ball of mass m, traveling at supersonic speeds, can crack a windshield, it does not mean a water droplet of the same mass and velocity will produce the same effect even if it has the same energy. A simple explanation can be given based on elastic and inelastic collisions theory, you know from school. The steel ball hitting the glass is in the elastic collision case characterized by high interaction forces, at least up to the moment the glass breaks. The water drop is in the inelastic situation, the impact forces being lower. We are in the case of a soft ball and a stone of the same mass hitting a window with the same speed. In the first case the glass survives in the second breaks. Because aircraft don't regularly fly at such speeds at altitudes where this might be a concern. The quoted problem (hitting a drop of water faster then the speed of sound in water) is never faced by any real aircraft. Even if because of the shock-wave there was no windshield in existence that would survive that impact, it wouldn't pose a problem, because no aircraft flies at Mach 4 at an altitude where it can encounter rain. Actually, no aircraft was ever capable of cruising at Mach 4. Besides some experimental prototypes, no aircraft could even fly at Mach 4. Even the handful of aircraft which can reach about Mach 3, can only do it high in the stratosphere, where the air is much thinner and there is no rain. Therefore, hitting a raindrop at Mach 4 is not an issue, because no aircraft can fly that fast. Actually, no aircraft flies much faster than Mach 1 at altitudes where rain is possible. Even the planned future aircraft which will be capable of sustained flight over Mach 4, will fly at that speed only when high above the clouds, because they would not be able to fly that fast where the air is thicker. Even if the problems would arise at Mach 1, aircraft regularly fly supersonic only in the stratosphere, where there is no rain. Actually, very few aircraft fly supersonic: airliners (except for the Concorde) are all subsonic, and even the Concorde only flew supersonic when it was flying high enough. Military aircraft, although many of them capable of supersonic flight, rarely ever fly supersonic, and even then only for short bursts. aircraft rarely (if ever) fly supersonic at altitudes where rain is a concern. Also bear in mind that when a droplet of water approaches a supersonic airplane windshield, it first encounters a supersonic skin layer of air, which would tend to buffer and deflect some component of the force before it hit the windshield itself. That is not to say that objects are prevented from hitting the glass...they do it all the time...but rather to say that much of the force will be dissipated, diminishing the urgency of the problem. Not the answer you're looking for? Browse other questions tagged weather windows or ask your own question. What kind of materials is being used for Fighter jets glass shields?  Which precautions should I take when flying in very cold / hot weather? How does flying below the freezing level in a thunderstorm help avoid the most critical icing? How does a pilot receive weather information when overflying the oceans? Do some aircraft windshields contain gold particles? How can an inexperienced pilot tell if the weather is good enough for flying? How do modern commercial aircraft handle dust storms?